I get that this is regarded as the better of the two sequels, but I am not so sure about that, to be honest. For one… there is just so much CGI. And not like a lot of movies, where there is CGI and you can forgive it, this is just in excess and in your face all the time. Reloaded just looks so fake in so many places, and that is highly disappointing. Especially after the last phenomenal piece of cinema we got, this is just a step down. I was not a fan of the heavy techno soundtrack, and there was just far too large a sexual component to this movie than there needed to be. Also, there were many scenes laced throughout here that were unnecessary and time consuming. A complaint my fiancé had was that the fight scenes all looked “soft” – nobody seemed to be getting into a real fight, things were too gentle and relied on a lot of low gravity and nothing really happening, but fists constantly being swung, you get what he means? What I did like though were those two creepy white albino twin things. They were interesting, and I thoroughly enjoyed the way they fought and morphed and moved. Something I have always wished about the Matrix movies is that they had focused just a little more on the relationship between Neo and Trinity, making it more real and understandable for us. Instead, their love story is something that just happened, no real introduction, no real fleshing out of it, always making it feel slightly less important than it needs to be. I really liked the keymaker, too. The storyline with Agent Smith is actually really cool, and there is so much that can happen from there. Also, the Seraph was incredibly entertaining, definitely a character that I thoroughly enjoy. I need to mention, you know my cape fetish? I have a thing for jackets, too (think my Peter Bishop jacket obsessions). 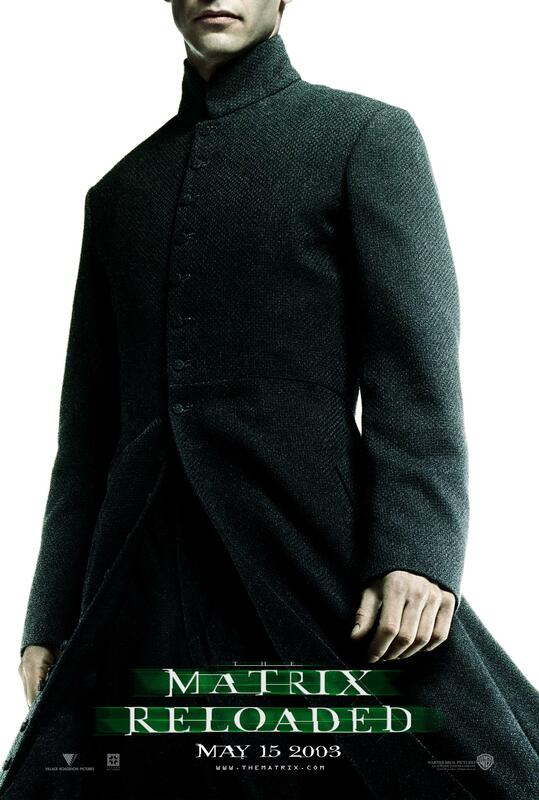 Well, Neo only just has the most badass jackets when he goes into the Matrix. I mean wow. Long, flowy, amazing… yes. I love it. I do. Alright, alright. Moving back to the movie, Reloaded is well worth the watch, continues to tell us more about the story and what is happening since Neo has come to save them all, and is pretty good, though it falls far short of its predecessor, something you cannot but compare it to. This entry was posted in Movies and tagged Agent Smith, Carrie-Anne Moss, good, Hugo Weaving, Keanu Reeves, Laurence Fishburne, movie reviews, movies, Neo, not great, The Matrix. Bookmark the permalink. Great review, I thought this was a decent sequel but I don’t think anyone compares to the first one. Neither of them are as good as the first on. You’re right, just uploaded my review of Desperate Housewives Season 1. Man its been soooooo long since I revisted the Matrix films. Great post!